You do need to have Avid Interplay Web Services installed on the Interplay network. Interplay Web Services is an optional part of the Avid Interplay Server install DVD. You can test this with your browser by putting in the Interplay Web Services IP and port. You need to get that IP and Port from your systems administrator. Individual Preferences are saved for each user. You can have a different user name, password, workgroup and Interplay IP for each user. When each user logs in, those preferences are used. In fact, you must enter this information for each user. Each user may change their preferences at any time. ProductionLink is licensed per seat using a hardware "Board Number" for identification. Each ProductionLink license can be used on either a PC or Mac. You register the Board Number and get the license. If you have separate PC and Mac computers, then that is two "seats" so two licenses are needed. 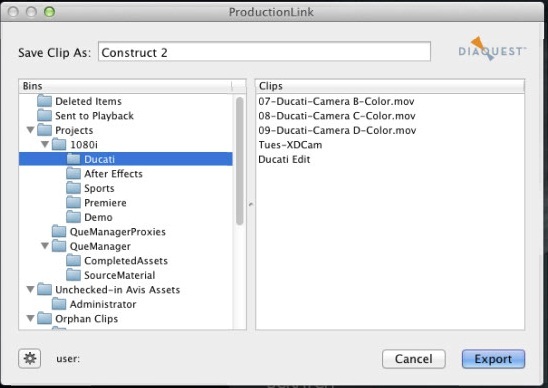 ProductionLink bundle works in both Premiere and After Effects. There is a separate plug-in for each and both are installed with the bundle. The same bundle license works for both Premiere and After Effects at the same seat. You can alternatively buy a Premiere only or After Effects only plug-in. Obviously, a Premiere only or After Effects only key will only work where intended. Can I export files from the Bin or only rendered projects? You can export either Premiere Projects or files from the bin. To export a Project, highlight the project Time Line Sequence. Then, in the File menu select Export and then Media. You can then make your setings and export. To export an individual file from your Premiere Project Bin, select (highlight) the file. Then go to the File menu and Select Export and then Media as above. Yes, Production Link works with Adobe Media Encoder. You can "Queue" your exports. They will then be entered into the AME queue list. When you intend to queue your exports to AME please be sure that all your settings are correct now. It is difficult to change one setting on one export in the AME queue without changing others. You need to get your settings, including path, correct before sending the export to the queue. The installer will install the plug-in to the CC 2015, CC 2014, CC, and CS6 locations. Thus, ProductionLink will work with CC 2015, CC 2014, CC, and CS6 (or all if all are installed). Demo Mode is the default before the license is installed. Demo Mode can also be used to view and demonstrate the Interplay interface when no Interplay is available. If you do an export in Demo Mode a dummy Interplay database bin explorer dialog will come up. The Interplay bin tree will be a simplified bin tree similar to that on an Interplay system. You still need to select a bin name and the end of a tree branch to do the export. When you render, Scratch will go through each frame but nothing will be written in Demo Mode. If you want to see the dialog again and render again, you need to "Bin All" as usual. This is true even though there is nothing to bin. To get out of Demo Mode you need to put in a valid license and uncheck the Demo Mode box. There is no uninstall on the Mac. On the PC you use Add Remove Programs in Control Panel to remove ProductionLink Helper. There is a ProductionLinkHelper application which makes the DNxHD files. Interplay permissions are handled on a per user basis inside Interplay. The Interplay user and password, etc are totally separate from the local computer user. The local PC user permissions hold for local computer issues.